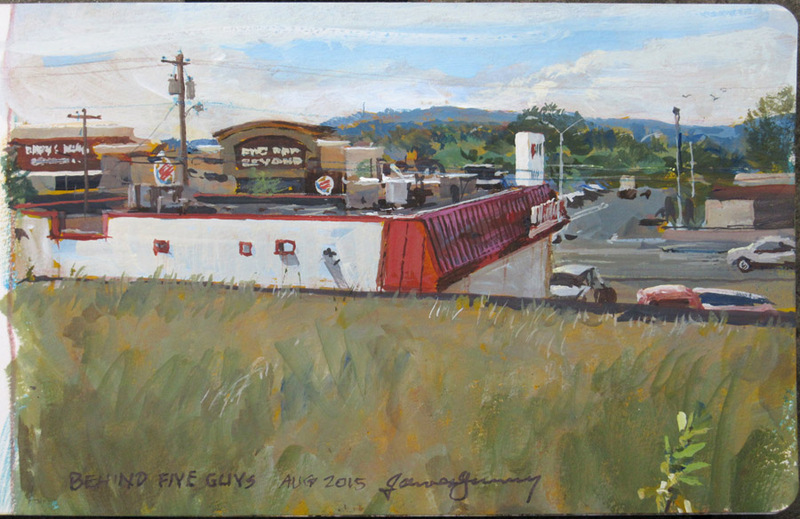 Painting the "franchise landscape," with its fast food restaurants and big box stores, feels to me like an unexplored frontier, full of exciting possibilities. I don't regard a scene like this as either "ugly" or "beautiful." Sometimes I feel like both of those labels can be barriers to observation, to really seeing. And seeing is the thing. But that doesn't mean that all commonplace subjects are equally attractive. I can't put into words why one view fascinates me and another leaves me cold. How much does this casein underpainting you use so often change the behavior of the gouache? 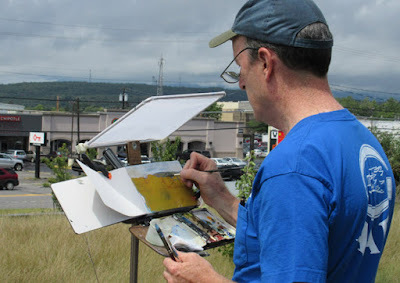 I'd think it slows down drying time quite a bit compared to painting directly onto paper, since the absorbency of the paper is no longer a big consideration. Wm, that's an extremely good point, and I'm so glad you raised it. If you put the casein on thickly, as I did here, the casein fills the pores of the paper. So just as you say, it leaves the gouache to float more on the surface, and the gouache definitely doesn't dry as fast. When I paint in oil, I like to use an oil-primed board (as opposed to a more absorbent gesso priming) for the same reason. It's kind of like roller skating as opposed to walking. Do you ever use gouache in dried cake or pan form? In Gouache in the Wild I noted you used tubed paint in all demos. I'm debating which way to go in adding gouache to my travel kit. For me pans would be more convenient. I'd like your opinion. What little I can find on the subject online leads me to believe that some don't like re-wetting, saying there's a loss of intensity but that seems counterintuitive. Oh, and on the topic of drying of casein and oils. I made up a dozen post cards (4" X 5") from two sheets of HP watercolor paper glued together. I intentionally didn't gesso the surface so I could use casein, watercolor or oils. I was startled at how fast oils dried on this surface. >But that doesn't mean that all commonplace subjects are equally attractive. I can't put into words why one view fascinates me and another leaves me cold. Could it be that you are looking for interesting/fascinating SHAPES and colours instead of traditional 'beauty' objects? Another winner, Jim! Not sure why, but this one really spoke to me. I love the pinkish reflection in the roof. Great to see someone really enjoy painting. Since gouache is kinda a forgotten medium in Germany, i discussed it with some people here and they criticized the matte-quality. I've really enjoyed learning to use gouache. I still have a really long way to go but your challenges have been great focused practice. I've been doing regular value studies and B&W master studies. I just submitted my August challenge to the facebook. I'm excited to see everyone's results for this month. If I could possibly add my thoughts on subject matter... I think, for me at least, shapes are important, regardless of the subject. But just as important is the quality of light. You can be in the most picturesque of locations but, if the light's not there, it won't be attractive as subject matter. Conversely, a seemingly mundane pile of scrap can be instantly transformed into something paint-worthy, when hit by just the right light. Sargent painted many watercolours of Venice, which is a magnet for artists. And yet, one of my favourite studies of his, is a washing line with white shirts hanging from it. I think it's the sign of a great artist when the viewer can look at that and think 'yes, I can see why he painted that'. I've noticed there are two underpaintings: a cobalt blue, then the mustard on top. Is there a purpose to the multiple colors? Sam, you're right, good eye. The blue was the background of a portrait that didn't work out. David, the light and atmosphere is so important. I can be inspired by an otherwise dull subject merely because of the lighting, or as Doug says, the shapes. I also was intrigued by the 3D depth, the entrance to the parking lot in the distance and the way the foreground grassy platform overlapped the building. Jared, I love the outdoor market painting you submitted. You're doing great things with gouache. Gyrus, I always thought of gouache as more expensive than oil or anything else, at least if you compare it on a price per ounce basis. Maybe regular watercolor is even more. Thanks, Jeff. 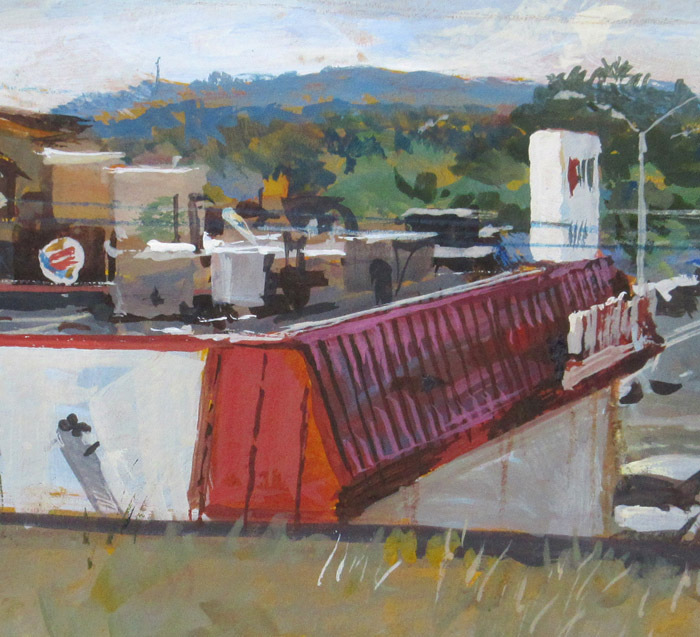 Figuring out how to paint that foreshortened red roof was a challenge! Very interesting and helpful video, thank you for sharing! I hope to get out there and try these techniques very soon!